Go with Prawns, def. big enough! Chefpatrick871 wrote: Go with Prawns, def. big enough! Ya, but I was working with what I had (I think they were 50/60). Wow, those are small! I have a ton of those in my freezer, probably gonna make some sort of bisque when I get back home. 50/60 are some crazy small shrimp. i made scampi the other night (i have yet to find a recipe better than the scampi at carabbas so thats how i rolled). the seafood section was closing early because of the weather and they only had 41/50's and 16/20's (friggin gigantic)... and they didn't have enough of the 41/50's for how much i was making, so the kid (i dont think he knew what he was doing) sold me the 16/20's at the same price as the 41/50's ...i was like, "uh......ill take them all then"
Damn. Why can't the people at the stores I go to be that dumb? the wicked child wrote: Damn. Why can't the people at the stores I go to be that dumb? Canaan isn't there to wear off on them. 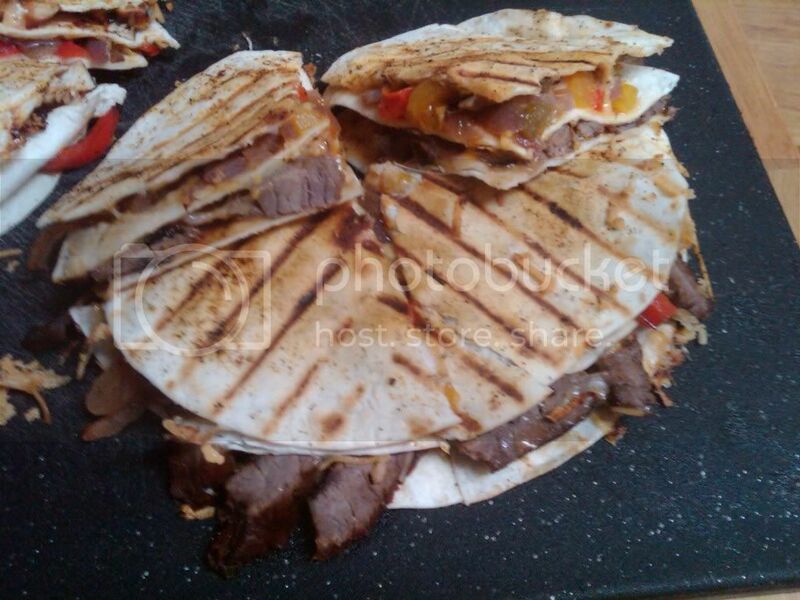 I made some sweet BBQ quesadillas tonight. I marinated some steak and a chicken breast in a mix of BBQ sauce, lime + cilantro. Both "grilled" (I use a grill pan here in my apartment). I also grilled some assorted bell peppers and red onion. 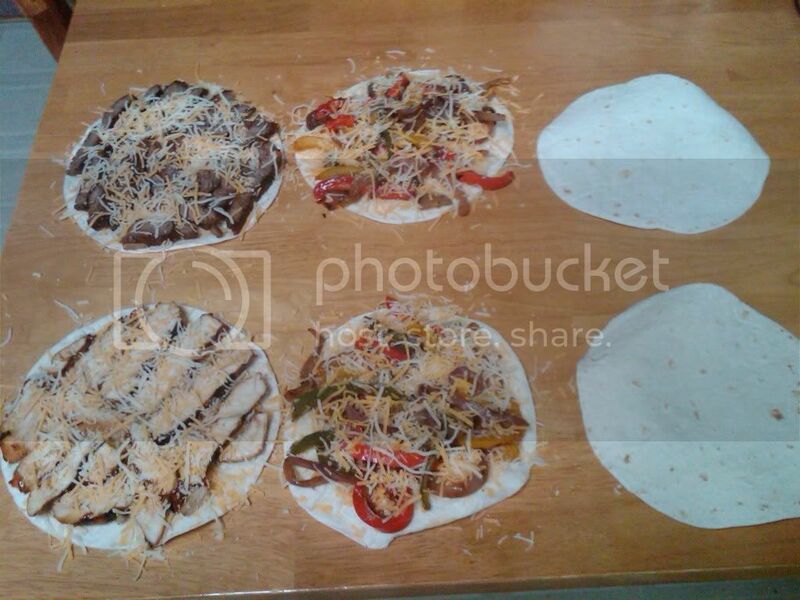 Laid out 6 small tortillas and covered 4 of them with cheddar jack cheese. Sliced the meat and put steak on one and chicken on another. Then on the next 2 with cheese, I cut up the peppers and onions and placed them on there. 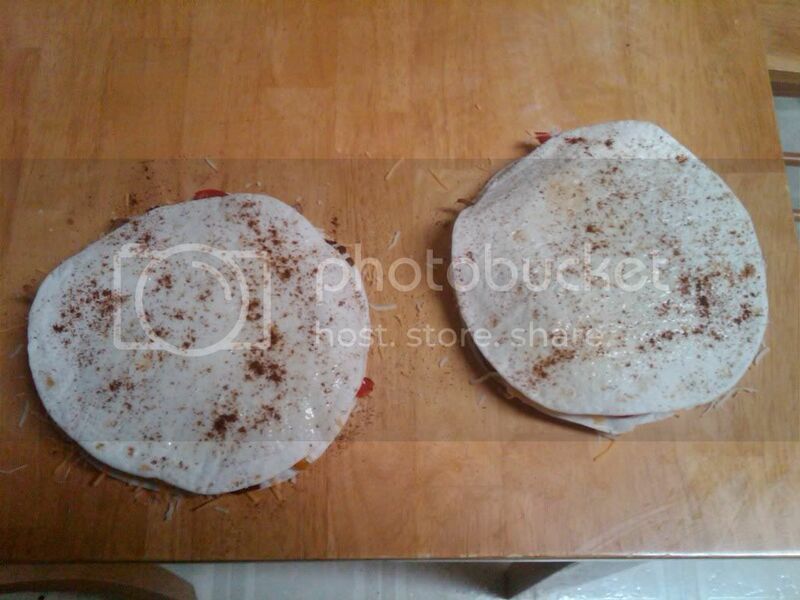 Then I stacked them, and on the top I covered it with some cooking spray and sprinkled some ancho chili powder on them. I cooked them until the cheese melted and then flipped them and cooked the other side (I applied the same spray + sprinkle of chili powder on the "new top" after placing them on the grill. Served with some ranch for dipping. It was a take on a recipe of Bobby Flay's in this cookbook and they both turned out quite awesome I must say. the wicked child wrote: I made some sweet BBQ quesadillas tonight. I marinated some steak and a chicken breast in a mix of BBQ sauce, lime + cilantro. Both "grilled" (I use a grill pan here in my apartment). I also grilled some assorted bell peppers and red onion. This sounds awesome.... I definitely want to try this!!!!! Dice one onion, one green pepper, and 2-4 serrano peppers (depending on size and heat tolerance), salt, pepper and saute them all in a dutch oven until tender. add about a half teaspoon to a teaspoon of minced garlic, stir for about half a minute, then add 1/2 cup of white wine (i like drinking white wine so i use it), a can of tomato sauce, a box of chicken stock (go with the low sodium version as there'll be plenty of salt from other things in this dish), and about a 1/4 cup of franks red hot (if you have bay leaf throw one or two in now). Allow to simmer for a while (just enough to cook out the alcohol and reduce a little bit). At this point, it depends on your taste, when i'm with my family i hit it with a stick blender (remove the bay leaf before hand) because they don't like the onion and pepper chunks. When it's me and my girlfriend, we do like the chunks so i don't blend it. Season 2 chicken breasts that have been cut into 1" chunks and brown them in a skillet, add to sauce. Get whatever sausage you'd like to put in (normally i check for hillshire farms spicy sausage, but kielbasa works just fine) and cut it into slices about half an inch thick (i usually cut on the bias just for fancy looking sausage) and brown those in a skillet and add to sauce, then take about 2-4 tablespoons of butter and melt it down in the skillet and add shrimp to get them cooked (i usually have about a pound of shrimp, shelled and deveined) cook them, then add to the sauce. At this point i usually add about 1 teaspoon of basil, oregano, and whatever other herbs i have and i also add some crushed red pepper flakes to it as well. while the flavors are all sort of melding together i cook a bag of jasmine rice (just follow the directions on the bag). when the rice is done, put some of it in a bowl, add a spoonful of the sauce/meat mix and enjoy! usually i get a nice loaf of sourdough bread and use that to soak up all the sauce left at the bottom of my bowl. dont know how i missed this one. french toast is just awesome. Colin Campbell will be at the game in Boston to make sure no dirty revenge shots are delivered to any fellow Cookes. What, what are you guys talking about? Chefpatrick871 wrote: french toast is just awesome. i made that this morning for my little sisters. it's especially good with the homemade bread i make. Wow you're a better man that I, I hate making bread, I just buy texas toast. I've recently enjoyed making different fruit toppings for my toast, so far peach and apple are my favs, I'd like berries but I found the frozen ones to have way too many seeds in them, so Ill wait til summer for fresh ones. make french toast, make a cream cheese sandwich with it and then fruit toppings (love apple) and then some whipped cream. i feel naughty just talking about it. Sounds fantastic, Tom's on Carson? yeah, on carson. i can't eat a whole lot of it (it is delicious, but i'm not big on sweet things), so i always recommend my girlfriend gets it so i can have a bite or two. 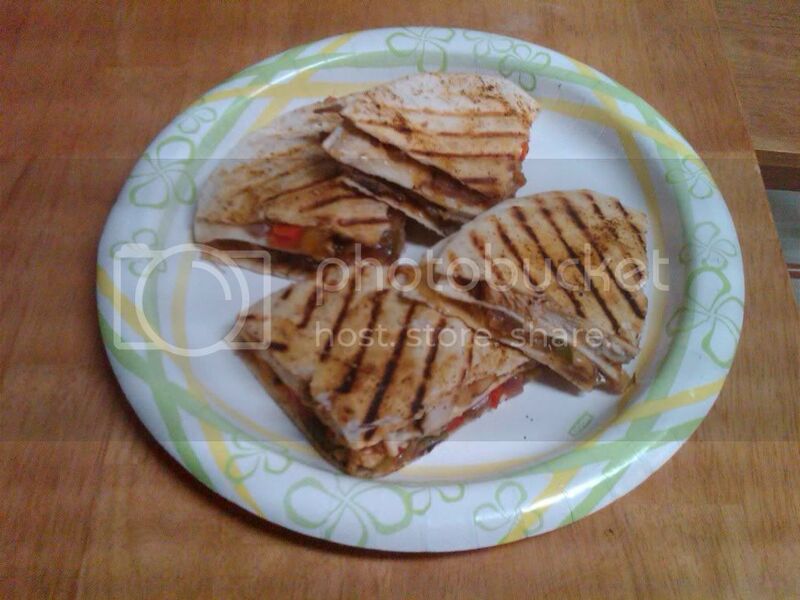 Took pictures to document various phases of my BBQ Quesadillas. yum. gonna have to try that some time twc. Meats are marinated in BBQ Sauce, lime juice, cilantro and water (to thin it out a bit). 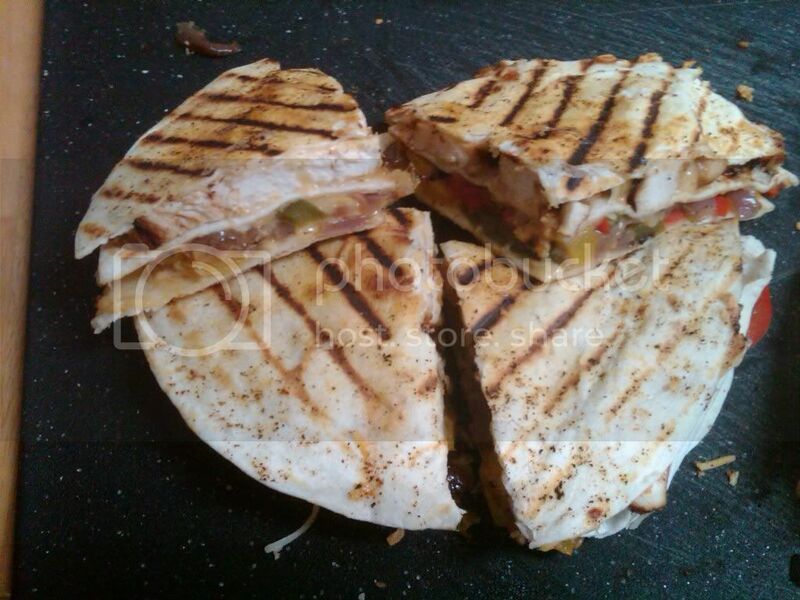 Other than that, it is just grill the veggies and meat and assemble... then grill the quesadillas. The spice on the tortillas is ancho chili powder. I used Kraft Mexican Style Cheddar Jack w/ 2% Milk Cheese. is cilantro something i can get at walmart? never bought it before. mac5155 wrote: is cilantro something i can get at walmart? never bought it before. I dunno. Any store that carries fresh herbs probably has it. If not, check the dried spices/herbs. I didn't have fresh this time so I used the dried. If its a super wal mart with grocery, then yes def. they have a decent produce section, it also can be frozen if you don't plan on using all of it. *** I have this dried but it is much less potent, I doubt you'll have any trouble finding it, they even have a tube of cilantro paste, and trader joe's sells it in a frozen package with 24 individual servings.